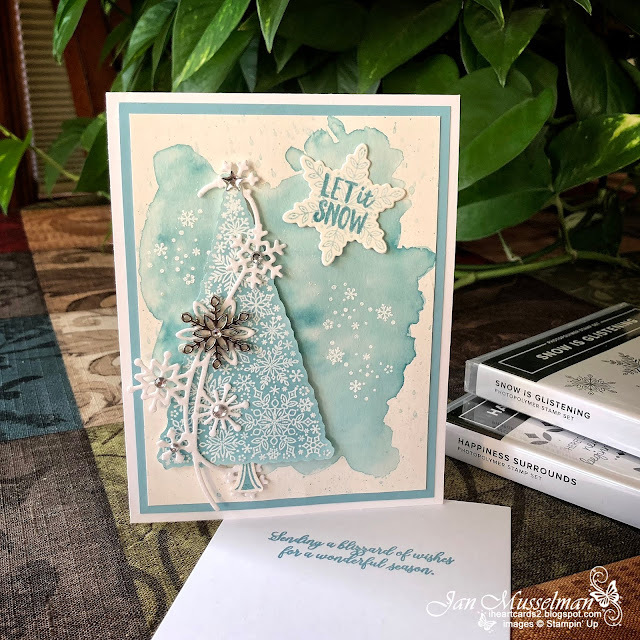 Welcome to the Snowflake Showcase Blog Hop!We are a group of Stampin' Up! Demonstrators from around the globe that Love what we do and Share what we love. This is a special hop to show you some of the possibilities using our newest Limited Edition sets. 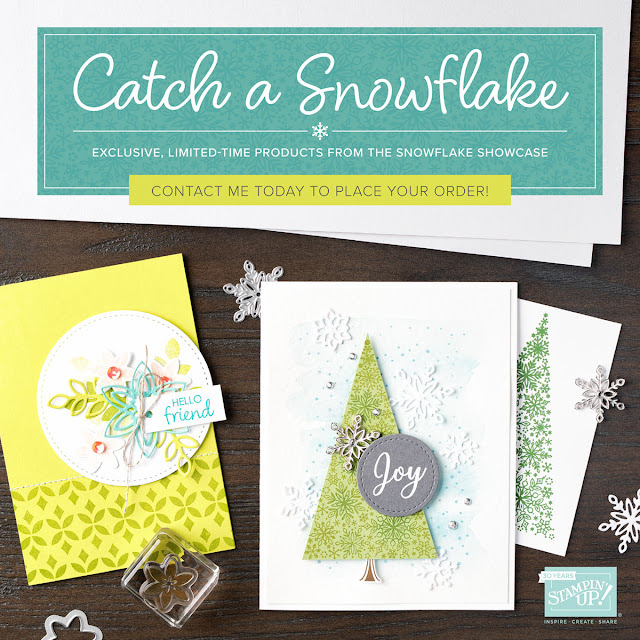 The Set that I chose to showcase is the Snow Is Glistening stamp set and the coordinating Snowflake Thinlits. A beautiful holiday set with so many Snowflakes to choose from. I love how the Balmy Blue Ink says cold and snowy to me. I used a couple of art stamps for the background, stamping off a couple of times to keep it light. Then I came in with the Snowflake stamps in the same color. 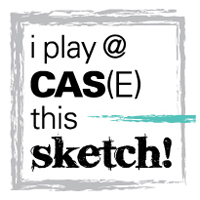 Stamping off once and sometimes full strength. Looks like snow flurries to me. I absolutely love the "Flurry Die"(my name for it). Especially paired with the White Velvet Sheets. 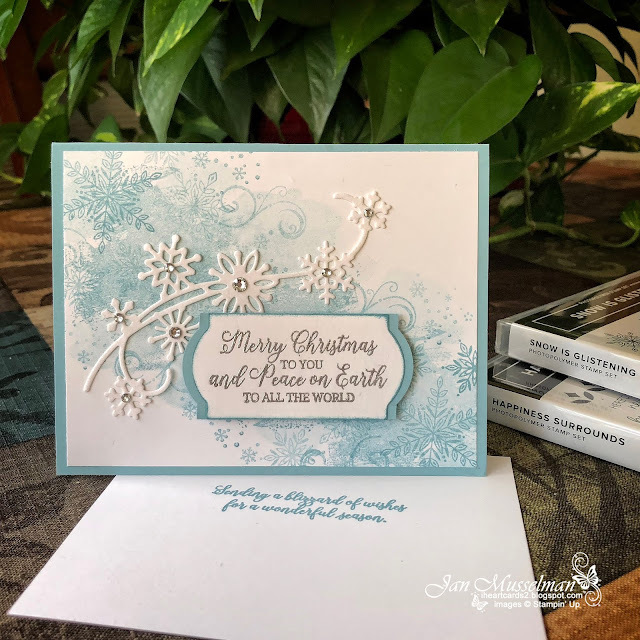 I added some Basic Rhinestones to the White Velvet Snowflakes ti tie them into my Sentiment Label that I Heat Embossed with the Silver Stampin' Emboss Powder. On my next example I Heat Embossed with White Stampin' Emboss Powder the Tree shaped Snowflakes onto some Whisper White cardstock. Then using a Sponge Dauber I sponged in some more Balmy Blue Ink. Then I fussy cut the tree with my Paper Snips. The card Front is a piece of Watercolor Paper that Smooched some ink onto. The Sentiment Snowflake was stamped off once with Balmy Blue ink. Then I stamped the sentiment full strength with the "Let It Snow" from the Alpine Adventure stamp set. I wrapped my Flurry Flakes around my tree and popped it up on the card front with Dimensionals. I finished with a Snowflake Trinket and some Basic Rhinestones. Also available is the Happiness Surrounds stamp set that can be used all through the year. It turns some of the Snowflake Thinlits into flowers. So you have 2 stamp sets that coordinates with the Snowflake Thinlit Dies. November 1-30, 2018, while supplies last. Purchase your set through me and you will receive FREE tutorials for these cards.